Dutch Orphaned Lutheran of Reformed Catholic. Home » Dutch Orphaned Lutheran of Reformed Catholic. Orphelines Luthérienne Catholique d’ Réformée. Source: Verzameling der kleederdragten in de Noordelijke Provincien van het Koningrijk der Nederlanden. Collection des costumes des Provinces Septentrionales du Royaume des Pays-Bas. Published in Amsterdam, Paris by Frans Buffa et Zoonen by Engelmann et Cie., 1828. Engraver: Hendrik Greeven (Dutch 1787-1854). Artist: Théodore Ferdinand Vallon de Villeneuve. Historical Asia costumes by Auguste Wahlen. 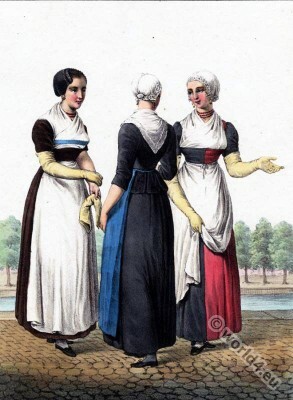 The Switzerland national costumes of 17th – 19th century originals. Africa, the landscape and the people 1931. This entry was posted in 1828, 19th Century and tagged Netherlands national costumes, Traditional dutch costumes on 1/28/16 by world4.